The 2019 Retreat will focus on joint programming and the co-creation of the organization’s agenda towards the UCLG World Congress in Durban next November. Special emphasis will be placed on building synergies through the Waves of Action and shaping the Local4Action Hub. The first part of the week, Monday to Wednesday, is dedicated to the work of the different parts of the network, including specific workshops. Thursday and Friday will include the first Policy Debate of the Advisory Group UCLG-UBUNTU, meetings of the Global Taskforce, and the Special Session of the Committee on Statutory Affairs. The first day of the UCLG Annual Retreat started with an all-UCLG internal conversation leading up to the 2019 World Congress and Global Summit in eThekwini-Durban. Participants discussed the key pillars of the 2019 UCLG Strategy and Work Plan emphasizing the need to pay special attention to partnerships with civil society, strengthening democracy, the implementation of the Right to the City and the need to build a true youth plan around the organization’s peace agenda. “We need to find the synergies, and identify the areas where we can enhance each other’s work. Be daring. Be active. Be collaborative. Only then will we identify our joint priorities” Emilia Saiz, Secretary General of UCLG. The day also witnessed a presentation on the upcoming UCLG World Congress by the City of eThekwini-Durban and SALGA. Representatives of the city highlighted dialogue and peacebuilding as key values in the municipality, and shared the commitment of both the city and South Africa in carrying out the event, and argued for the need to carry out the Congress beyond the venue and ensure that the it is intertwined with the city. The afternoon was devoted to interactive sessions on Communication, the UCLG Learning Forum and the Metropolis Governance Committee. The UCLG Retreat served as starting point for discussions as preparation for the 4th Learning Forum that will take place in the framework of the UCLG Congress. Through a collaborative exercise, the World Café, the Retreat helped find new synergies and collaborations and shed light into the needs and expectations of the learning agenda and the forum. The communication workshop aimed to inspire a spirit of co-creation and was a unique opportunity to jointly achieve greater visibility and impact of the actions of local and regional governments in societies around the world. At the end of the day, members of the organization wrapped up the session in a stock taking exercise in which they shared their highlights of the day and their hopes for the retreat. Concluding the day, the networking hub saw bilateral and informal meetings and the presentation of the Metropolis practice. More #UCLGmeets tomorrow with the UCLG Campus and the Waves of Action! Stay tuned for more! Day two of the UCLG Retreat focused on ensuring that the UCLG agenda remains relevant and to identify policy recommendations related to strategic topics. UCLG’s work centered on advocacy, learning and reporting has been seen as a way to bring local governments to the centre of the realization of the development agendas and, bringing that point forward, the day began with a workshop to enhance the local and regional governments’ reporting process to the High-Level Political Forum that will take place in July, and further explored the next steps for our constituency in the reporting process at national, regional and local level. President Parks Tau introduced the session focusing on linking the work of the UCLG Consultation Mechanisms to the priorities of the World Organization highlighting the need to work in collaboration to achieve the global goals. Participants were invited to join working sessions organized by three key priorities: Leave No Place Behind, inspired by the work of the Policy Councils on the Right to the City, and Opportunities for all; where participants discussed how to guarantee the local implementation of the New Urban Agenda maintaining its universal scope and the specific circumstances of regions, metropolitan areas and cities of all sizes. “The implementation task is daunting, but it depends on the energy we place on it, and our collaborative action will be important to take us forward. The retreat is a part of this: it reflects on how far have we come, how far do we still have to go, what do we need to do?” Mpho Parks Tau, President of UCLG. The workshop on Strengthening Local Democracy was inspired by the work of the Policy Councils on Territorial, Multilevel Governance and Sustainable Financing, and the Right to the City; where the +çdiscussions revolved around the promotion of participatory age-responsive dialogues among a wide rage of people and cultures and to brace local democracy and inclusive and participatory societies. In parallel, the workshop on Resilient Territories took place; inspired by the work of the Policy Councils on Safer, Resilient and Sustainable Cities, and Territorial, Multilevel Governance and Sustainable Financing where the UCLG membership discussed how to foster a holistic and multi-level approach to develop an All-UCLG resilience strategy. Later in the day, participants took stock of the milestones and the concrete outcomes of the UCLG Waves of Action. On the Wave of Action on Housing, panelists addressed the evolution from the shift to the adoption of the “Cities for Housing” declaration at the High Level Political Forum, as well as the steps that were taken to harness the momentum that sparked during the meetings in New York. The Wave of Action on Migration took stock of the milestones on migration (from the New York Declaration and the Mechelen Declaration to the adoption of the Global Compact on Migration in Marrakech), as well as the efforts made in shifting the narrative on migration). Finally, regarding the Wave of Action on Financing panelists highlighted the the UCLG Strategy on Localizing Finance, as well as the Municipal Investment Fund to allow local governments to borrow money, as some of the key outcomes of the Wave of Action. At the end of the session, participants pitched concepts -Open Governmnent, Gender equality, Accessible Cities, Public Space- that would end up setting the path for the Waves of Action 2019-2020. Concluding a full day of interactive meetings the Networking hub saw the elevator pitch on the UCLG Culture Summit in Buenos Aires and the Working Session of the Community of Practice on Housing. On our way to the UCLG Congress! Tomorrow, the feast of the municipal movement at #UCLGmeets! The third day of our UCLG Retreat was the Feast of the Municipal Movement, which marked the way towards the UCLG Congress. Participants discussed the major topics and ideas that will shape our triannual event and emphasized the need for cities to listen to civil society, citizens and partners. The day kicked off with a video by our partners from PLATFORMA showcasing their Awards, with parallel working sessions organized by the Forum of Regions and the Committee on Social Inclusion, Participatory Democracy and Human Rights. Boasting an all-female panel, a brief stock-taking session inspired the participants of the Retreat to think about the world that we live in, to challenge pre-conceived notions about how to solve the world’s problems, and to develop a more inclusive model. “The UCLG Congress needs to be relevant to the membership, to the movement and to the world. It needs to be relevant to all stakeholders. I sincerely hope this gathering will reflect our full strength, the diversity of our organization, and our capacity to work with others”. Parks Tau, President of UCLG. During the morning, the voices of the UCLG World Congress shared their priorities and vision for the event that will take place in Durban, showcasing the importance of placing peace, local democracy, and dialogues among different stakeholders, and among different generations, at the core of the agenda in order to develop peaceful and sustainable societies that leave no-one and no place behind. “We need to be listened to, but this time we need to listen. Transformation is in our hands and it is about co-creating, not only consultation. Come to the Congress not to just exchange but actually to take decisions and start a process of policy making.” Emilia Saiz, Secretary General of UCLG. The afternoon was devoted to the specific policy priorities of the UCLG Sections focused on three cross-cutting issues: Climate Action, Finance and Localization. Each region of the world faces different challenges regarding climate action. Members looked at how to build regionally-adapted advocacy in the transition to a new ecological model, bearing in mind that ecological transition goes far beyond climate adaptation and mitigation policies, and must include resilience, circular economy and a change in production and consumption patterns. Participants also discussed how to build a common strategy and report it together with other partners and sister organizations, and the audience presented their views at the end of the presentations. Last year, the World Organization adopted its renewed strategy on Finance, putting the issue of localizing finance for sustainable development at the core of its strategic priorities. During the debate, UCLG Sections expressed common messages on the strategic lines of action in support of the localization of financing and how to best adapt the global review strategy to the regional institutional frameworks and advocacy. The Local4Action Hub will aim to consolidate our global network of members and partners while advancing the implementation of the SDGs at local and territorial levels. The debate revolved around how to build a regional localization advocacy strategy and the added value of the Local4Action Hub for the Sections. 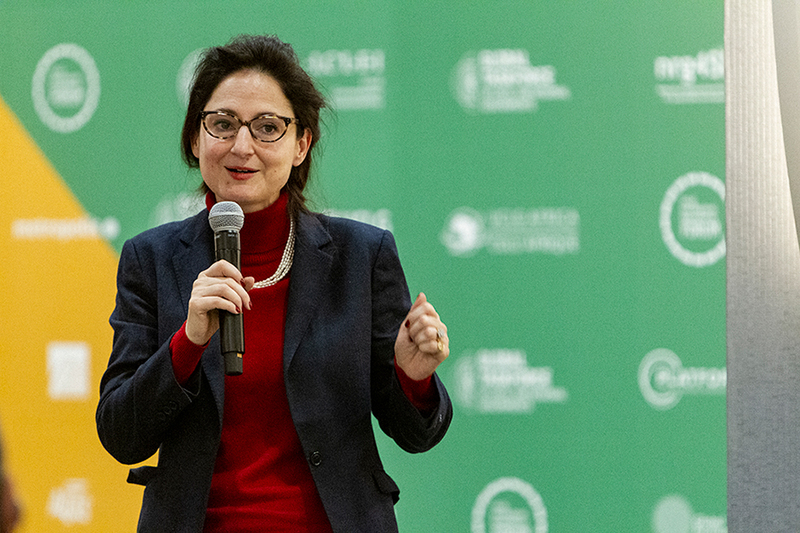 In the stocktaking session, Emilia Saiz, Secretary General of UCLG, pointed out the main outcomes of these first days of the Retreat on communication, learning and the localization of the SDGs, and emphasized the importance of linking all of the work areas of the organization and improve relationships around the network. The day concluded with an elevator pitch on the Peripheral City Forum by Ary Vanazzi, Mayor of Sao Leopoldo. One of the key highlights of the fourth day of the UCLG Retreat was the celebration of the Political Debate of the World Organization, which was by members of the newly created UBUNTU advisory board, that for the first time had the opportunity to exchange with the political leadership of UCLG as well as with the key partners from the Global Taskforce (GTF). Prior to the start of the UBUNTU debate, Christelle de Chremiers, Elected municipal representative of Gien and Vice-President of the Centre-Val de Loire region highlighted how local elected representatives can change the rules of the game when it comes to food policy in her elevator pitch on food democracy. Our UBUNTU advisors Ana Falu, Professor and researcher at National University of Córdoba; Jorge Pérez Jaramillo, Dean of Architecture Faculty, University of Santo Tomás in Medellín; Aromar Revi, Director, Indian Institute for Human Settlements (IIHS); and Debra Roberts, Co-chair of Working Group II, Intergovernmental Panel on Climate Change (IPCC); spread their wings on their first official gathering , inspiring the political debate of the World Organization by highlighting the challenges and opportunities of the future, and calling on local and regional leaders to rise up to the occasion to lead their communities into the future. “The territorialization of the SDGs is mandatory, since the 2030 agenda is lagging far behind. We need to experiment at the local level to be able to move forward." Roland Ries, Mayor of Strasbourg and Co-President of UCLG. “This troubled world needs to make us reflect, and bet on international institution reform. We need to reinforce multilateralism and the position of local governments, who are full actors of sustainable development” Carlos Martínez, mayor of Soria and Vice-President of UCLG for Europe. The first meeting of the year for the members and partners of the GTF was also held in the framework of the UCLG Retreat. Member networks of the GTF discussed their contribution to the achievement of the global agendas, and the challenges and opportunities that 2019 holds for the constituency. The three thematic axes of the session were aligned with the priorities of the constituency. Thus, the Climate Agenda, The 2030 Agenda and its localization, and the New Urban Agenda and SDG 11 were main topics on the agenda. The celebration of the second Local and Regional Governments’ Forum within the High Level Political Summit in New York was among the key issues of the session, in which members and partners of the GTF agreed on the need to consolidate it as a space that goes beyond exchange and becomes a space for the priorities of the constituency to be considered. The UN Department for Economic and Social Affairs (DESA) presented the two HLPF edition to be held this year, and indicated that the spirit of this year’s Forum would be to hear about concrete actions and steps that LRGs are taking to implement the SDGs. The constituency further addressed their strategy in both the High Level Political Forum and the UN SDG Summit, highlighting the upcoming Local 2030 event in Seville as the most important political milestone on the localization agenda building up to the HLPF. Member networks of the GTF discussed other key moments to achieve maximum political and media impact, such as the representation of the Constituency at the 4th Session of the UN Environmental Assembly, and the UN Climate Summit. Further, the UN Habitat reform was identified by participants as a key moment in which the constituency could bring about their priorities, as well as key for political mobilization. The G20 agenda was also a topic under discussion, which encompassed the second gathering of the U20 -taking place in Tokyo- and how to best ensure the link between the U20 agendas and those of the rest of the constituency. The consolidation of the space, increasing its influence on the G20, and standing up for climate, were identified as main objectives of this year’s edition. The day came to an end with the workshop on Reporting and Monitoring of the SDGs, in which the GOLD team at the world secretariat gave insights on how local and regional governments could bring their views to the monitoring and reporting process of the global agendas. The last day of our Retreat saw the meeting of the UBUNTU advisory board with the UCLG Presidency. Members of the Presidency and our UBUNTU advisors had a fruitful political debate on the future of the World Organization and on the role that the UCLG World Congress need to play as consolidator of the municipal movement and to strengthen the voice of local and regional governments in the international agendas. Gender equality as a key topic for local and regional governments was also on the spotlight. Laura Pérez, Councillor for Feminism at the Barcelona City Council presented the Metropolis initiative Safety and public space: Mapping metropolitan gender policies. This initiative aims to reduce the existing gap in the use of public space between men and women. Concluding the 5th Edition of the UCLG Annual Retreat the Committee on Statutory Affairs to set the scene of the electoral framework and the structure of the UCLG Congress after the discussions held during the week.